TBGS-Made Violin for Sale – Proceeds to our young musicians. At TBGS we are passionate about teaching music musically. Students are encouraged in lessons to perform and compose music, and to be actively involved with the content of the lesson. Students learn how to make musical decisions and grow to become critical thinkers. 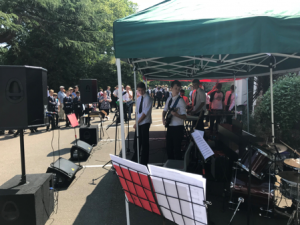 In the TBGS music department we believe it is important to engage pupils by teaching music students listen to in their day-to-day lives, developing their musical knowledge through their own preferences. Students harness a variety of skills through their time studying music. They will develop communication skills through their group work, as well as improve the analytical, logical thinking and creative parts of their brain through listening activities. 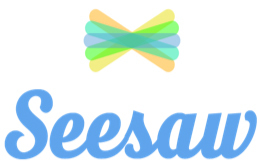 Because most of the work we produce in music is over once it has been performed, we use the Seesaw app to record and document student work. Work is uploaded to a student’s account and can be accessed or reflected upon at any time, allowing teachers and parents to chart students’ musical progress over time in a secure manner. KS3 is used both to inspire students’ creativity and prepare them for GCSE. Students will have access to a diverse selection of instruments (wind, keyboard, rock band, percussion etc), musical cultures and technologies (including Sibelius notation software and Mixcraft DAW). Every year the music department rents a set of instruments from a different part of the world for one term. Students play and study these instruments, leading up to performances in our World Music Concert. In the past students have played and composed for steel pans, Javanese gamelan and samba drums. 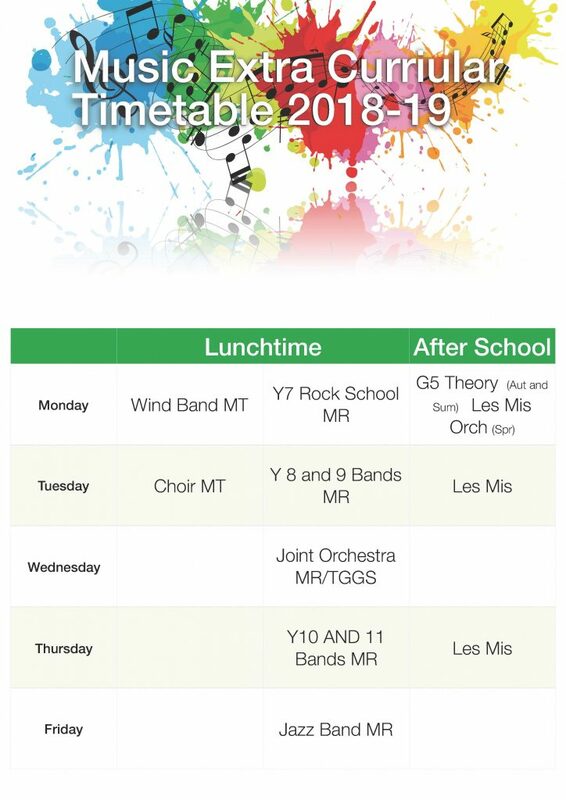 In Year 7, students learn a wind band instrument – clarinet, saxophone, trumpet, trombone, baritone or euphonium, which they choose in collaboration with the teachers at the start of the year. Through year 7 students use this instrument to develop their performing and composing skills, as well as experiencing the discipline it takes to learn an instrument. At the end of the year, the very best students perform in the year 7 concert. Through year 7 students will also have the opportunity to use the music programme Sibelius to write a fanfare, as well as develop vocal skills. At the start of Year 8 students receive a foundation course in keyboard playing, which they then use as the basis of their learning for the rest of the year. Learning in Year 8 is more topic-based, with students studying composition over chords, jazzand hip-hop. We also start to explore music technology in more depth. 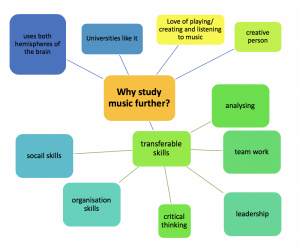 This prepares students for GCSE music, and the modern music industry, as well as enabling students to fully express their musical ideas outside the limitations of their performance skills. the rest of the year students work in the music computer suite to do compositions using the music programme Sibelius and Mixcraft.. 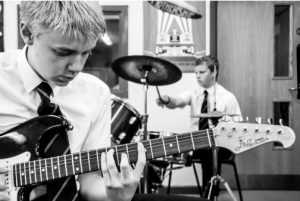 In Year 9, students get to form their own band and choose instruments such as guitar, bass guitar, and drums to play. Throughout the year they advance musically as well as growing in independence and developing teamwork skills. 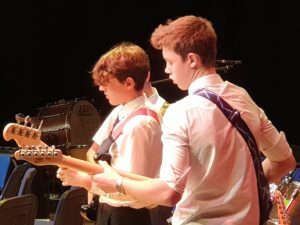 Through this, they study Reggae, Riffs and even get to Pupils finish year 9 with a completely independent project, which encourages organisational and social skills, choosing and create their own version of any song as part of a band. Students in Year 9 compose a concerto for soloist and string orchestra using Sibelius, a fusion piece using the year’s World Music instrument and a film score. Learning about texture, instruments and sonority in Jazz, Blues, Musical Theatre and Chamber music. Studying the way that musical devices are used by film composers in the 20thand 21stcenturies. Including rock, pop, fusion, and dance music. 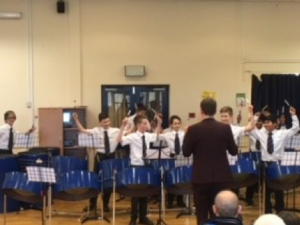 Assessmentis through Performing (one solo and one ensemble piece), Composing(two pieces) and Appraising(answering questions in response to musical extracts. Students will further develop their musical skills, knowledge and understanding through the practical and academic study of a broad range of musical genres, engendering a passion for the subject. Students are encouraged to make links between the disciplines of composing, performing and appraising, becoming independent, reflective and enquiring musicians. An integrated approach is taken to teaching of the music A Level. Students take the opportunity to perform works from each area of study and to compose using the stylistic conventions of the relevant genre. Listening and appraising is used to support composition and performance work as well as develop the critical skills required for the examination. Rock and Pop, Musical Theatre or Jazz. Students study two large scale set works: Brandenburg Concerto No 2 (JS Bach) and Dances of Galanta (Z Kodaly) as well as a learning about music from a huge range of different cultures. They must also complete a ‘Musical Links’ essay. Assessmentfor all qualifications is through Performing,Composingand Appraising(answering questions in response to musical extracts, though the exact requirements differ for each. The music department is a lively and active part of the school, which gives all members of TBGS lots of opportunities to get involved in extra-curricular music making. 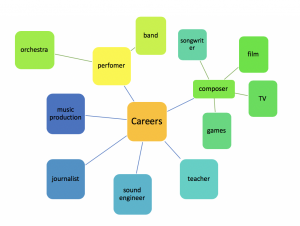 Much of the music performed is influenced by the students’ interests. There is a wide variety of opportunities for pupils of TBGS to perform or show work to parents and the public, includings an Autumn Gala Concert, Carol Service, World Music Concert,Year 7 and 8 Concerts. In 2018 the music department and student council hosted the inaugural Tor-chella Music Festival. 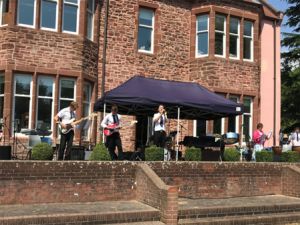 A variety of acts performed on across three stages for the whole school and some proud parents and guardians, supported by students from various tutor groups and teachers who provided food and other entertainment.